BLOOMINGTON, Ind. 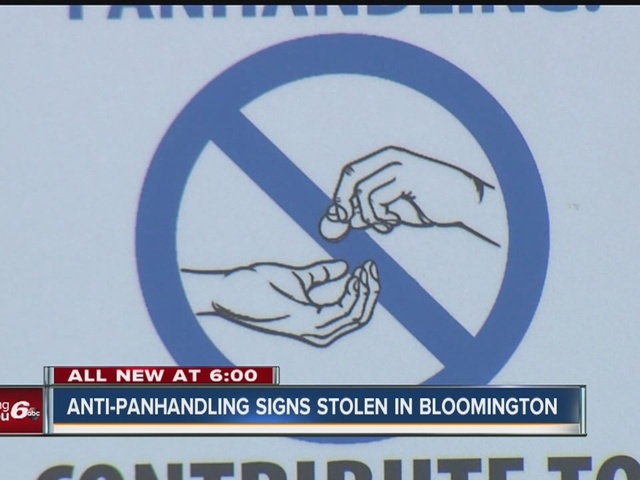 -- More than 20 signs encouraging people in Bloomington, Indiana to donate to homeless organizations rather than give to panhandlers were stolen. The city put up 28 signs, encouraging people to donate to organizations listed on the "Bloomington Gives" website. Of those 28 signs, 24 were stolen, all from the downtown area. Police hope security camera footage from local businesses will help in the investigation. The city warns against aggressive panhandling. Mary Catherine Carmichael, the Bloomington City Communications Director, said the city will have additional signs made if necessary.